Sutton group’s Mattu Realty’s website needed a redesign as their old website did not showcase the number of properties they were selling/had sold. The new design creates a clear navigation for users. The website targets home-owners as well as developers so there are distinct elements dedicated to each audience. The website is responsive so it is displayed well on mobile devices and tablets. Much of the content is pulled in dynamically from one page onto many pages so that maintaining the website only requires minimal effort. With a beautiful full-width image as the homepage’s backdrop, visitors are welcomed to the website by a captivating scene of Vancouver. Listing pages have all the info developers may need. Each listing’s info can be changed according to needs and images open up in Fancybox. Each of Mattu Realty’s past projects are dynamically plotted onto a Google map that allows users to zoom in and out. Additionally, projects are also listed under the map with thumbnails and excerpts. The entire website is responsive and totally mobile-friendly! To showcase the completed projects, each project page displays a slider banner that rotates between images. Additional photos may be uploaded in the project description. All info is transferred from the project’s listing info so there is no need for duplicate data-entry. 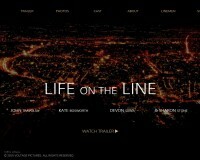 The homepage is an immersive experience with the title and city backdrop animated in CSS to match the trailer.